It’s that time of the day again when we say “Step Away From The Reels” and advise you to take the opportunity to try something else. In this case it’s Keno in the shape of Jackpot Keno from Microgaming. Keno has some similarities with bingo in that numbers are crossed off a game card but there are differences and it’s worth checking out. This particular version is rather basic but the rules and the gameplay remain the same so keep reading to find out how to take part in this popular pastime. 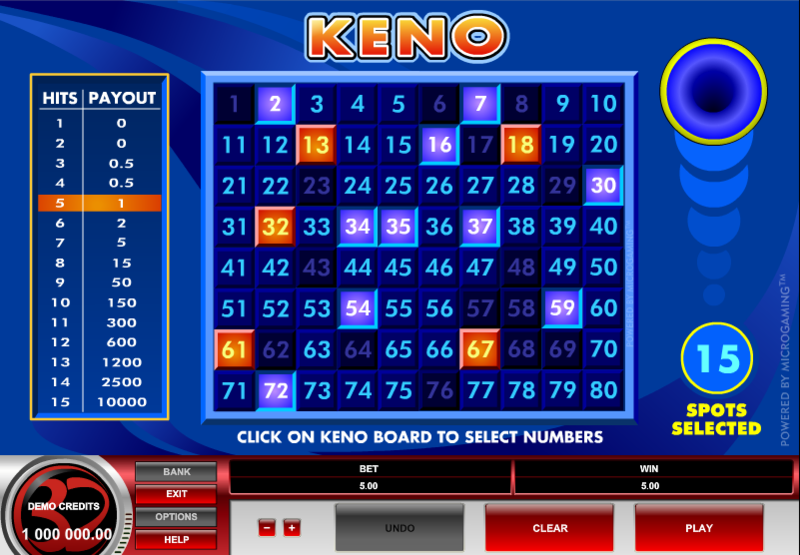 Jackpot Keno follows the standard rules of Keno and when you first load it up you will be faced with a 10 x 8 numbered grid containing the numbers 1 – 80. You can select 1 – 15 numbers on that grid after which 20 random numbers will be drawn; you will win prizes depending on how many numbers match. The number you need to match depends on the number you select to being with. For example, picking just one number offers a payout of 3x for a match while you will need to match at least 3 numbers if you are picking the maximum of 15; the payout would be 0.5x. Once you’ve selected you numbers, just click the ‘Play’ button in the bottom righthand corner and you will see 20 randomly drawn balls fly out of the blue thing on the right and on to the grid. Matching numbers are marked off automatically so at this point any player interactivity has effectively ended. Now all you need to do is (hopefully) enjoy your win, clear the board and start again; there’s no option for automatic picks so you’ll have to do all the number picking legwork yourself. This is not the best Keno game we’ve played and you can click here for some alternatives we’ve reviewed. Additionally we can’t locate an RTP for this game so we’re inclined to steer clear. If you’re interested in Keno strategy, unlikely as that might sound, click here.